This girl is a tank. Could be more feminine and a little longer neck, but she is a tank. I might keep her. That Blaze Face would make her an easy sell. Sired by Grandmaster. Born late September. Last edited by Bright Raven on Sun Mar 17, 2019 9:44 pm, edited 1 time in total. How old? she would be a keeper around my place. Late September. Standing by her Dam. Taken this evening. Finally getting some dry days, Joy. Joy. Last edited by Bright Raven on Sun Mar 17, 2019 9:48 pm, edited 1 time in total. What's in your water over there, I have a couple October bulls that aren't nearly late big. It is not the water. It is the wood elves. She’s nice. That heifer begins her a ways is nice too. Thank you. The one back there on the left is a Broadway heifer. I wonder where she got being a tank from Ron? If I was looking I think I would start with her mother. You are on to something there. Yes. Her mom is a tank and she stays fatter than any cow I have ever had here. I think she would be fat if you just gave her air and water. Also, you can see where she gets that short neck. Is that who puts out your free choice feed for you these days? I do that but not free choice and only for the calves. There are a couple heifers that are getting pulled down. Not bad but I got them trained to come into a pen away from the other cows. I started about 6 weeks ago feeding them a supplement. If I put out a tub, then the cows that don't need it would probably eat most of it. Very nice looking one. 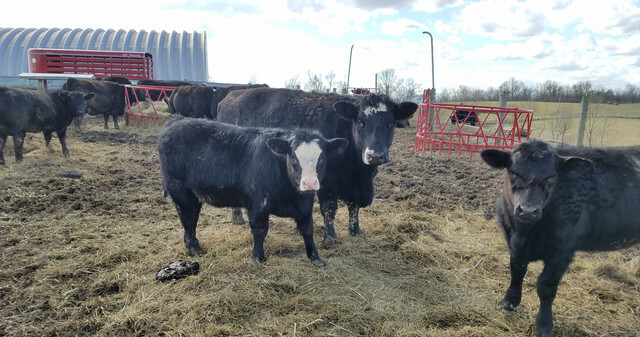 Harsher winter weather doesn't seem to affect your cattle at all! Great calf! I'd definitely keep her, too nice to sell. Great looking heifer. Don't keep all the really good ones to yourself . 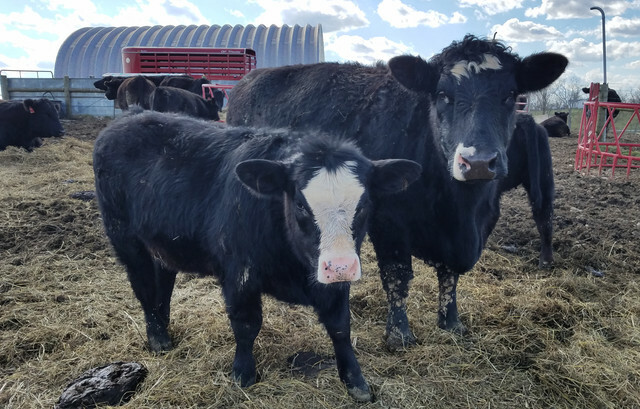 Used grandmaster loved him, they could get short and squat if used incorrectly.. best set of commercial heifers I ever saw was a set of grandmasters in alabama. Nice calf ron.